Beauregard-Keyes House. Detroit Publishing postcard, 1903. The Beauregard-Keyes House, at 1113 Chartres Street in the French Quarter, looks like it doesn’t quite fit with the surrounding buildings on the same block. It has a rich and well-documented New Orleans history that is open for us all to explore, adding to the many historical landmarks of the famed New Orleans neighborhood, which in itself is a National Historic Landmark. But don’t judge a French Quarter house by its exterior. 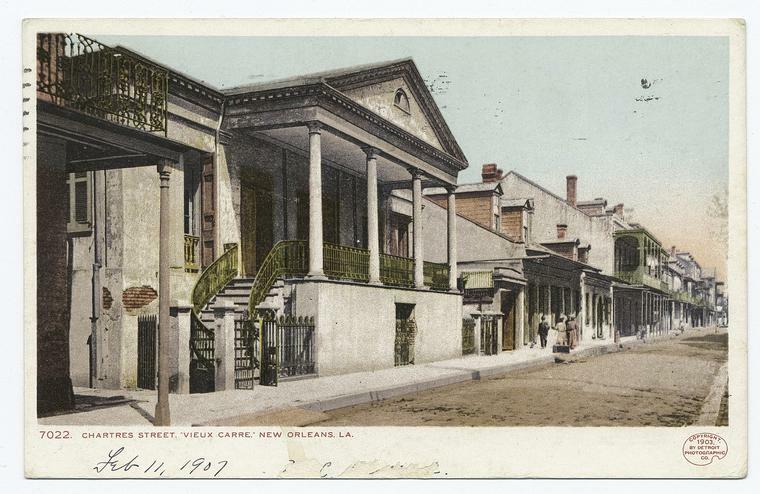 The house at 1113 Rue Chartres was built on two lots of ground that were originally reserved to be a weapons arsenal. When a group of Ursuline nuns from Rouen, France, arrived in New Orleans in 1727, the King granted them several lots on the corner of Rue Conde’ and Rue St. Adrien (which later became Chartres and Ursuline Streets). The Ursulines were also granted the two lots across the street which were reserved for an arsenal, but the order never developed that property. The city passed from French control to Spanish, then briefly back to French, so Napoleon Bonaparte would sell it all to the United States. Original photo that became the postcard above. All of these different governments recognized the Ursulines as the owners of most of the 1100 block of Chartres. In 1824, the nuns decided to sell off lots across the street from the convent. An auctioneer and businessman, Joseph Le Carpentier, bought the two lots on the corner of Chartres and Arsenal (now Ursulines). Le Carpentier contracted with an architect from Baltimore, Francois Correjolles, to design a house and garden. Le Carpentier and his family lived in this house until 1835, when it was sold and he moved into the Royal Street home of his daughter and son-in-law, Alonzo Morphy. Their son, Charles Paul, would grow up to become the world-famous chess champion.But don’t judge a French Quarter house by its exterior. The house at 1113 Rue Chartres was built on two lots of ground that were originally reserved to be a weapons arsenal. When a group of Ursuline nuns from Rouen, France, arrived in New Orleans in 1727, the King granted them several lots on the corner of Rue Conde’ and Rue St. Adrien (which later became Chartres and Ursuline Streets). The Ursulines were also granted the two lots across the street which were reserved for an arsenal, but the order never developed that property. The city passed from French control to Spanish, then briefly back to French, so Napoleon Bonaparte would sell it all to the United States. Le Carpentier sold the house to John Merle, a Swiss immigrant who became Swiss Consul in New Orleans. Merle’s business encountered financial difficulties, forcing him to liquidate his assets, and the house was then acquired by the Andry family. Well-known planters from St. Charles Parish, the Andrys (and later a branch of the family, the Garidels), owned and lived in in the house until 1866, when it was sold to Dominique Lanata, originally of Genoa, Italy. Lanata, who was Consul-General of Sardinia in New Orleans, had extensive holdings in the city, appears to have bought the house as an investment. One of his first tenants was the war hero, Pierre Gustave Toutant Beauregard. The general moved his family to 229 Royal Street in 1869, but by then, the legacy of the house on Chartres had been sealed. The Lanatas sold the house to Corrado Giacona, in 1904. The Giaconas were in the wholesale liquor business. The Giaconas experienced all sorts of difficulties rising from dealings with elements of the Sicilian Mafia, and on June 18, 1908, Corrado’s father, Pietro, shot four members of the “Black-hand Mafia” dead on the back gallery of the house. Corrado and Pietro were indicted for murder, but the case was dropped in 1910. The consensus was that Pietro had done the city a favor rather than committed a crime. Pietro passed in 1917, and Corrado and his mother placed the house up for auction in 1925. Antonio Mannino, who was married to a Giacona, purchased the house, with the hope that preservationists would step up and buy the property to spare it from the wrecking ball. The Times-Picayune ran an article that seriously embellished the history of the house. The publicity worked, and General Allison Owen led a group of concerned citizens who purchased it. The Owen family were known for their association with the Louisiana Historical Association, founders of the Confederate Memorial Hall, near Lee Circle. Even though the house had been spared, little work was done on it until a writer decided she simply had to live in New Orleans. Frances Parkinson Keyes was steered towards the “Old Beauregard House” in 1945. She immediately began to renovate the house, living in the front of the house at first, then moving to one of the back buildings, so the main house could be exhibited. Mrs. Keyes lived off-and-on (she was originally from New Hampshire and would winter in New Orleans) from 1945 until her passing in 1970. In 1955, the original group that purchased the house in 1926 sold it to the Keyes Foundation. Mrs. Keyes established her foundation in 1948, with the twofold purpose of helping writers and preserving historical places. Mrs. Keyes wrote 30 novels during her time living at 1113 Chartres, including Dinner at Antoine’s, and The Chess Players, about Paul Morphy. The French Government awarded her the Legion of Honor for her 1947 novel, Came a Cavalier, a romance set in Normandy over the first half of the 20th Century. Since 1970, the Keyes Foundation has operated the Beauregard-Keyes house as a museum and event venue. Tours are offered on the hour Monday through Saturday from 10 a.m. to 3 p.m. Regular admission is $10 for adults, $9 for students and senior ctizens and $4 for children ages 6-12. Tours start promptly at the top of the hour, with the last beginning at 3 p.m. Just go up to the front door on the first level (up the outside steps) and ring the doorbell at the top of the hour. Shameless self-promotion department: Both General Beauregard and Frances Parkinson Keyes are Legendary Locals of New Orleans!